In a landmark report released today, the United Nations called on governments worldwide to pass legislation requiring clinical trials to be registered, and their methods and results to be fully reported. 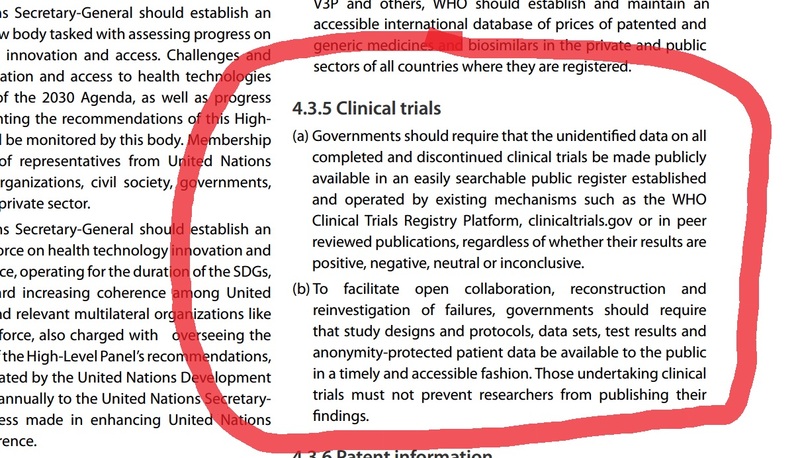 The report, authored by a high-level panel appointed by UN Secretary General Ban Ki-moon, explicitly calls for clinical trial study designs, protocols, data sets, and test results to be made publicly available. It is fantastic that the UN has today added its voice to the call for more clinical trial transparency. The UN’s report sets out many of the problems that the nearly 700 organizations who are part of the AllTrials campaign are striving to fix, and proposes some real solutions. Anyone who is not already working to overcome these problems should join us now. Launched in 2013, the AllTrials campaign calls for all clinical trials past and present to be registered, and their methods and results to be fully reported. Governments should require that the unidentified data on all completed and discontinued clinical trials be made publicly available in an easily searchable public register… regardless of whether their results are positive, negative, neutral or inconclusive. To facilitate open collaboration, reconstruction and reinvestigation of failures, governments should require that study designs and protocols, data sets, test results and anonymity-protected patient data be available to the public in a timely and accessible fashion. Those undertaking clinical trials must not prevent researchers from publishing their findings. Health technologies developed with public funds at universities can be lifesaving for individuals and populations far removed from the academic institutions in which they were invented. In many instances, public funds are used to support clinical trials, comparative effectiveness trials or trials undertaken during global health emergencies… For the public to reap the full benefit of the public investment in research, public funding agencies must ensure that, when feasible, data, results and knowledge generated from such public investment be made broadly available… In all cases, public funding agencies should strongly encourage patenting and licensing practices that benefit public health, including the use of non-exclusive licences, donation of intellectual property rights, participation in public sector patent pools and other mechanisms that can maximize innovation while promoting access. Increased transparency of clinical trial information is an important contributor to improved public health outcomes. Secondary and meta-analyses may change clinical practices and reveal that interventions are ineffective or unsafe, as happened in the case of selective serotonin re-uptake inhibitors antidepressants.